There is no question that the beer scene in Charleston is a burgeoning business and the Original Pub & Brewery Tours of Charleston is at the forefront of the revolution. Besides being the only locally owned and operated beer tour in the land, owners Becca and Daniel Lesesne are certified cicerones, assuring that you will get the experience, knowledge and professionalism of all that the world of barley and hops has to offer. The history of local beer in Charleston is a sordid one that continues to write it’s own script. Becca Lesesne has been in it from the beginning, but cites her colleague and friend, Jaime Tenny as the real revolutionary when it comes to forging the way for craft brewers in the Holy City. Pop the Cap, was a grassroots effort begun in 2006 by Tenny and her supporters. Their mission was to abolish the prohibition era laws restricting the alcohol levels of locally produced beer to at our below 6 percent alcohol by volume (ABV). One of only five states to retain this limitation, (West Virginia, Alabama, Mississippi and Arkansas were the others), the law prevented nearly one third of the world’s beer styles from being bought or brewed in SC. Tenny and her team, including the Lesesnes, petitioned, lobbied and eventually convinced lawmakers in Columbia to lift the 6 percent ABV cap for beer in SC. In May of 2007 the cap was raised to 17 percent ABV, opening the doors for local crafters to produce wider varieties including stouts, porters and bocks. Craft brewers in the state celebrated by brewing beers that were once taboo. Charleston, a world-class tourist destination, was now poised to offer a world-class beer selection. The Lesesnes saw opportunity. They had met in Charleston while employed at a carriage tour company. Becca had been in the beer business years prior, while living in Asheville, North Carolina. When she returned to Charleston, her hometown, she brought her love and enthusiasm for a good local brew with her. She and Daniel reconnected on the carriage tours and decided it was time to start their own. In 2008 they started Original Pub Tours of Charleston to share that passion. “For us it’s about sourcing local. People are into local food and now we have great local beers. We want folks to know that they don’t have to drink commercial brews when there are so many great local options,” expounded Becca. In 2010 South Carolina passed the tasting law, which allowed breweries to share their delicacies with visitors in a limited capacity. Out of this, the Lesesnes expanded in 2010 to include local breweries in their tour offerings, many of which use local ingredients to finish their brews. 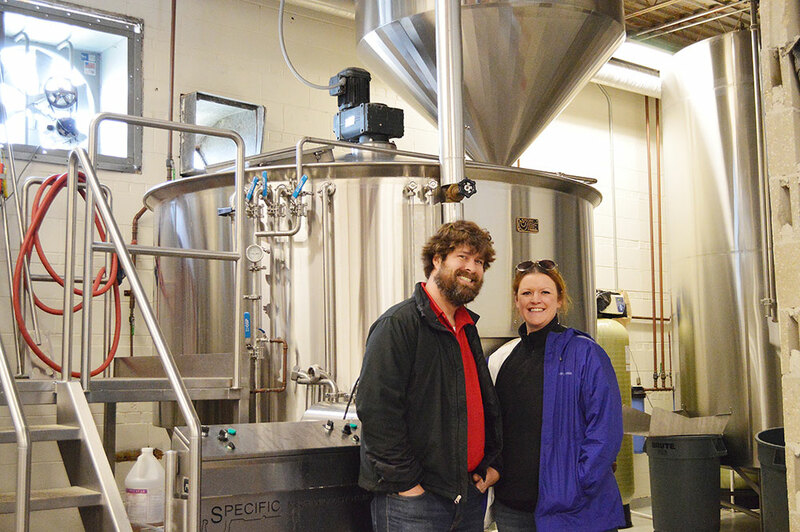 One such brewery is owned and operated by Jaime Tenny and her partner David Merritt. Tenny and Merritt started Coast in 2007, right around the time they championed the SC Cap law. Their North Charleston brewery and beers reflect their lifestyle: simple, conscientious and well done. They consider their effect on the environment in everything they do, from choosing ingredients to producing, packaging and delivering their beers, which can be found in numerous bars and restaurants throughout the state. Other breweries along the tour include Holy City Brewing in North Charleston, Palmetto Brewing and Tradesman Brewing Company on James Island. “Palmetto Brewing is the oldest brewery in the state, with the most interesting history,” explains Becca. “The original Old Palmetto Brewery was started back in the late 1800’s, before prohibition.” It ran in Charleston up until 1913. Palmetto Brewery as it now stands has been serving South Carolina since 1993. Pub and Brew Tours of Charleston offer tours year round for aficionados and novice beer drinkers alike. Pub tours visit three to five historic pubs throughout downtown Charleston and last approximately 2.5 hours. Brewery tours board the “Brew Bus” and stop at three different breweries in the 3.5 hour time frame. Participants can purchase growlers at each stop. Both tours include plenty of samples and a delicious dose of local history. Read the article on James Island Messenger.